A book review by James Clarke. 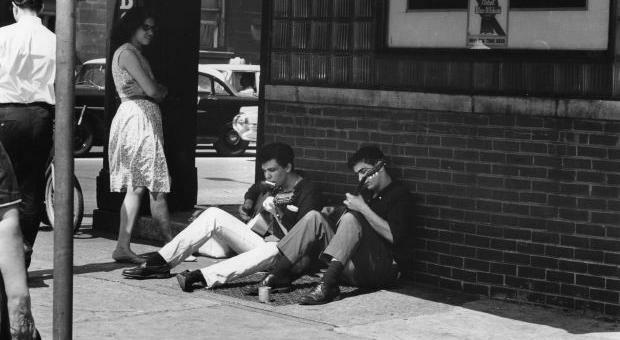 Bloomfield and his friend Roy Ruby playing at the corner of North and Wells in 1964. Photo by Raeburn Flerlage. I remember the first time I heard the song “Born in Chicago”. The power of the sound coming from Paul Butterfield’s harmonica was like a freight train coming through the speakers—and then Mike Bloomfield’s guitar. That guitar. I played “Born in Chicago” over and over again until finally letting the whole record play through, flipped it, then on to side B. I spent the afternoon air guitaring “Our Love is Drifting” so intently that it made my fingers hurt. In Michael Bloomfield: The Rise and Fall of An American Guitar Hero (Chicago Review Press), Ed Ward chronicles this magnificent talent and the conflicts he faced during a career that was anything but meteoric. He spent years learning from and playing with the best. Wanting to be the best. And most of all, wanting to create authentic music. He fought insomnia. Many attribute his need to “turn it off” as a major factor in the drug use and addiction that took his life in 1981. He wrestled with stardom: feeling the resentment of bandmate Elvin Bishop, an accomplished guitarist in his own right who’d been overshadowed with Bloomfield’s addition to the Butterfield Blues Band. He wanted to be known for his talent and not for his name—rejecting projects and gaining notoriety for leaving gigs or not showing up in the first place. He was wrought with anxiety: exiting in the middle of the night from the Super Sessions recordings with Al Kooper (Stephen Stills being added the next day in his absence). Legendary promoter Bill Graham, despite often being the victim of Bloomfield’s absenteeism, noted that Michael wasn’t as serious about anything in his life as he was his music and its authenticity. A great irony in all of this is that when it came to those directly involved in the music, Michael was authentic as it gets. Bob Weir has referred to Bloomfield as a scholar and a teacher to the west coast musicians. Muddy Waters introduced him frequently as his son. BB King wrote to him to ask him to come back to music after slipping out of the scene while on hard times. Bob Dylan, who invited Bloomfield to play on “Like a Rolling Stone” and with him at Newport in 1965—two defining moments in American music history—tried unsuccessfully to recruit him as part of his touring band. Bloomfield felt his place was with Butterfield—-playing Chicago Blues. Dylan would later call Michael Bloomfield the greatest guitar player he’d ever known. Ed Ward does a great job of both referring to Bloomfield as a “hero” in his title while at the same time approaching his flaws without hesitation. We see a great character develop—part student; part star; part child; part old soul; someone pursuing perfection while riddled with imperfections. A young man who aspired to be the real deal.